This is an Independence Day article (of sorts). It is a story about a woman of independent spirit, but no independent means born over 100 years ago – Arline Kinsel Brown – and a group of independent young women of the 21st century. The last days of the last semester of the year are every high school teacher’s nightmare. The seniors have been accepted (or denied) at the college of their dreams, the juniors are exhausted, and the Southern California sun lures everyone outdoors with the promise of summer and sand. 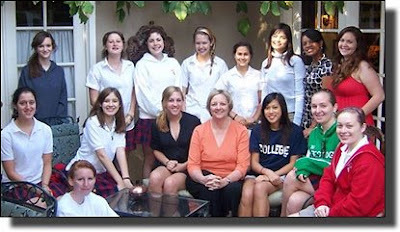 I felt a bit like a senior myself; this would be my last semester after eleven years teaching American Literature at Mayfield Senior School, an independent Catholic all-girls high school in Pasadena, California. My honors course in American Literature focuses on the American spirit and its early roots in Puritan religion and Yankee hard work. When we read works by Louisa May Alcott and her transcendentalist father, Bronson Alcott, I share photocopies of a manuscript letter from Louisa to her friend Annie Fields. It is written in Louisa’s lovely 19th century hand and the girls enjoy deciphering her penmanship and interpreting the colloquial phrases. We spend considerable time looking at the subtext, the story written “between the lines.” We talk about what isn’t being said, as much as what is said. And, we talk quite a bit about how the stories we read aren’t really so different from the stories of our own lives. Somewhere in the discussion, I mentioned that I was researching the life of a woman who lived in the early 1900’s by reading her letters and papers. That was enough to catch their attention. “Married how many times?” “The same man twice?” It didn’t take long for a classroom of 17-and 18-year olds fascinated with TV drama to see the soap opera potential in my tale. Two sisters having a good time, Mercy (in dark dress) and Arline. Talking to the students about the project early on proved to be helpful in several ways. At a personal level, I now felt committed to the project; no backing out when the logistics and preparation threatened to become overwhelming. Another bonus was the girls’ growing anticipation. Students inquired on my progress in getting the letters ready to be read; they asked about the authors’ background; they made connections between the time period of the letters and the decades they were studying in their U.S. History class. They also wanted to know how I came to have the papers. At first I played down my own relationship to Arline Allen Kinsel. I thought they would find her story more intriguing if she was “just a woman” rather than my grandmother. When I did at last reveal her relationship to me, I could see a few raised eyebrows. Hmm. My grandmother isn’t like that. At home, I worked on preparing for the class project. My grandmother did indeed live in at least five western states and marry five times. When she died in 1967 she left an old trunk filled to the top with letters, receipts, and a lifetime of paper. I first delved into the collection in 1976 when I wrote a paper on her life story for a university class in family history. Then the letters went back into the trunk where they rested in a Lucky Lager box for twenty years. I wish we knew then about the damaging effects of acidic cardboard, heat, and moisture. The trunk itself was first stored in my aunt’s back house, a little unheated room off the garage that reached sweltering temperatures in the summer. Then it was moved to a garage. . . equally brutal. The papers were eventually rescued and came to me, “The Family Curator.” In every family there seems to be one person who takes all the stuff everyone realizes is important but no one else really wants to store. That’s me. The papers came to me in five banker’s boxes and a couple of beer crates. I have not officially tallied the total number of items, but at least five hundred letters, over two hundred photos, and numerous certificates, deeds, and legal documents are now safely settled in archival storage boxes. Sometimes I feel quite rich. Sometimes I feel quite exhausted. I began transcribing the letters in the summer of 2007, as soon as school ended for the term, and by this spring I had barely dented the stack of correspondence. It would be wonderful to have my students assist as interns in the project. I also started a blog, The Family Curator, to keep a record of my progress. Although I have many wonderful photographs, I wanted the girls to read the original letters and meet the writers in words before seeing their pictures and making judgments based on appearance. Each letter was scanned and transferred to the school server. The girls logged on to the server, retrieved the letter, and worked on their transcription in a Microsoft Word document. The first day of the project was exhausting. Confusion reigned. The girls had considerable difficulty deciphering the 19th and early 20th century handwriting and phrases. I had not considered that Colo. and Tex. would be seen as individual words; they had never heard of state abbreviations other than CO and TX. It was clear by Day Two that the girls were gaining familiarity with the handwriting. Students came to class and went directly to a computer to retrieve their files. At times, silence reigned. Then, I interrupted their work to share the photographs. It is true, “pictures talk.” My students were fascinated by the photographs. What was particularly interesting to me was the way the photos seem to reinforce their earlier impressions gained from reading the letters alone. For example, several girls were working on letters from Roy to his divorced wife, Arline. Some girls thought he sounded like a scoundrel. “Why does he keep telling her to ‘be good’” they asked. Others thought he seemed sweet and misunderstood, a husband abandoned. has not been discovered. 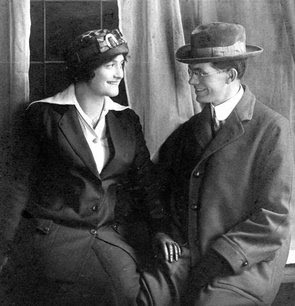 Roy and Lucile divorced in 1912. The students got into a lively discussion over the most misunderstood – Roy or Arline. When I explained that the couple was involved in a bitter custody battle over their small daughter, even kidnapping her back and forth, they went back to the photos to see they if they could reconcile this new information with the faces in the photograph. Was it significant that there were only two photos of Roy in all the many photographs? Who was the man inked out in a snapshot. Roy? Another husband? A beau? 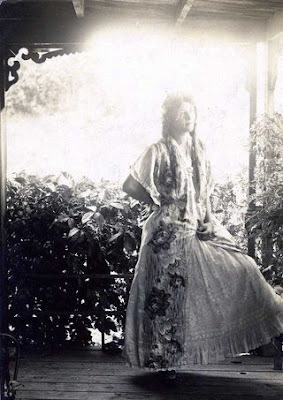 So many pictures of Arline, clearly a young woman who liked to dress up and pose for the camera. So many pictures of Lucile. about 1912. Arline on the porch of the ranch house. By Days Three and Four, the students were comfortable working with the documents. After finishing their transcriptions, the girls worked with a partner to read the letters aloud and check their work for errors. This proved to be a great exercise in sharing ideas about the text as well. Fast typists kept the workflow moving. At the students’ request, I sketched a rough family tree on the board. Arline’s papers included correspondence written to and authored by every member of her family – mother, father, sister, aunts, cousins and more. At the conclusion of the project we held a roundtable discussion led by the seniors. Each girl spoke for a few minutes about the subject of her letter and read a section she found particularly interesting. 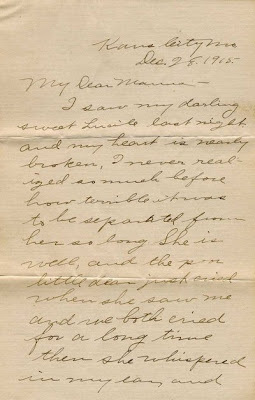 their separation in this letter to her mother. in Beulah. 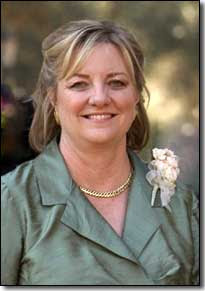 Arline’s hair is noticeably dark; she was a natural blond. As we read the variety of letters, it was clear that this was more than just Arline’s story, it was also the story of the many women she knew and loved. Mercy Kinsel and Angus MacPhee. Yellowed news clippings added authority to Papa Kinsel’s warning, but the lovely wedding photograph of Mercy and Angus MacPhee contradicted the story. Mercy looks tenderly at Angus, her gloved hand resting comfortably on his leg. He returns her look with a bit of a Scottish smile – was he really a con man who would sweep a young schoolteacher off her feet and force her into drugged prostitution? 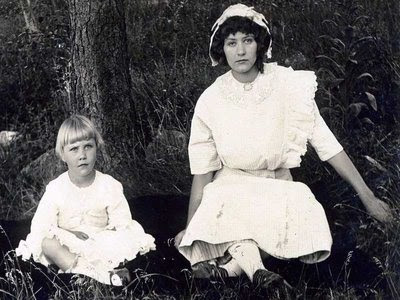 More snapshots from later years show their three young children. 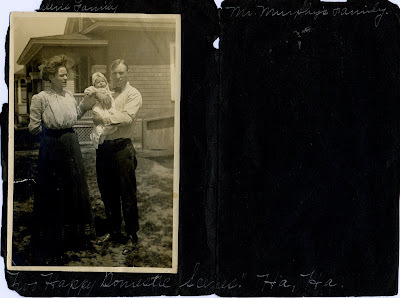 Without the photographs to balance her father’s letters, Mercy’s story was quite different. 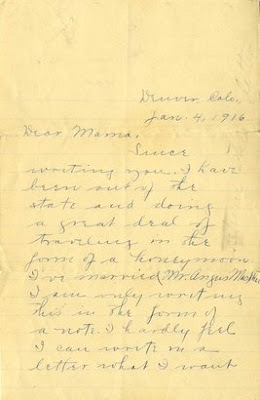 Mercy’s letter to her mother announcing her marriage to Angus. her mother such news in a letter. The final day of class, my students came to my home for breakfast. It is a tradition I initiated my first year of teaching and have enjoyed continuing. Together we viewed a slide show of photos from Arline’s trunk, the sighs (and a few tears) bore witness to the project’s success. P.S. Has this project changed the students’ attitude toward the value of written letters? What a great legacy that your grandmother left - many of us wish for that level of insight into an ancestor's life! I think that was a fantastic idea for a school project, and I'm glad your students not only enjoyed it but learned something. I hope it inspires a few of them to take a closer look at their own ancestors are learn more about the times they lived. What a wonderful project for your students - and what a wonderful legacy your grandmother left you! She was truly an amazing woman. Thanks for sharing her story with us. Absolutely wonderful! Thank you for sharing your grandmother's story and the story behind the project. I must admit to feeling a tinge of jealousy at your having all those letters and photographs, LOL. What a wonderful "problem" to have! This is a great article and I really enjoyed reading it. What an exciting way to teach the girls about the past as well as keeping the spirit of family alive. I am sure that they all now have so much interest in discovering some history about their own families. I wish that I'd had the opportunity to work on such a project when I was in high school - and that my family left such a paper trail behind them. Hopefully other teachers will learn from your experience and figure out how pass the past along to their students in the tangible way that you have done. Thank you fM for the chance to share this project. Maybe there is a future for developing a program that would bring personal history to even more students! It would be wonderful to see the field grow. 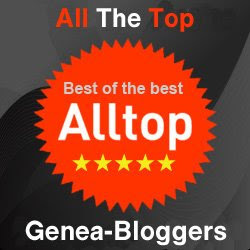 Footnote Maven shared your site with me; she is my niece's relative. I am an English teacher near Sacramento and LOVED this fabulous "assignment". How wonderfully engaging it was for disengaged seniors! Thanks, JBG. It was great fun and so rewarding. Let me know if you want to try something similar; I'd be glad to help any way I can.